The second day of the second Test between India and Australia took place today at the new Perth Stadium. Australia began the day strong with Tim Paine and Pat Cummins troubling the Indian bowlers. However, a flurry of wickets after Australia crossed the 300 run mark led to them being bowled out for 326. In response, India lost both Murali Vijay and KL Rahul very early. Cheteshwar Pujara and Virat Kohli then steadied the ship before Rahane came into the picture after Pujara's dismissal. He put on an unbeaten 90 run partnership with Kohli to put India on top at the end of the day. While Kohli remains unbeaten on 87, Rahane is unbeaten on 51. Apart from the Test series, there has been a lot going on in the world of cricket. 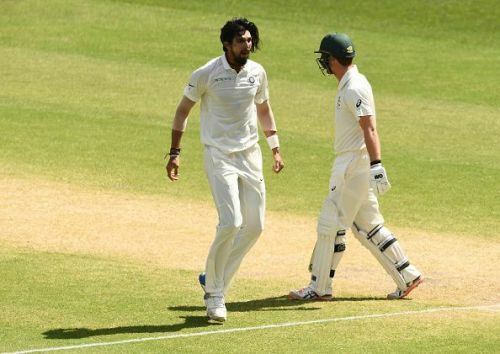 A couple of days ago, footage was revealed that Indian pacer Ishant Sharma had overstepped on many occasions during the first Test against Australia in Adelaide. However, the umpires failed to notice these deliveries. Ishant was asked a few questions regarding this during the press conference after the second day's play of the second Test at Perth. He hit back at the media saying that they should be the ones to answer the question. "Maybe Australian media should answer the question. Not me. I have been playing cricket for so long. And these things happen. Because you are a human, you are bound to make a mistake. I was not worried about it at all," Ishant said during a press conference. He finished with 4 wickets in the first innings of the second Test.